Make yourself at home in one of the 124 guestrooms featuring minibars and flat-screen televisions. Complimentary wired and wireless Internet access keeps you connected, and satellite programming provides entertainment. Private bathrooms with shower/tub combinations feature deep soaking bathtubs and hair dryers. Conveniences include phones, as well as desks and coffee/tea makers. A stay at Arcadia Hotel Bielefeld places you in the heart of Bielefeld, steps from Theater Bielefeld and Old Town Hall. This hotel is 15 mi (24.1 km) from Gerry Weber Stadium and 16.9 mi (27.3 km) from Zoo Safaripark Stukenbrock. Enjoy recreation amenities such as bicycles to rent or take in the view from a terrace. Additional features at this hotel include complimentary wireless Internet access, concierge services, and a banquet hall. With a stay at Centro Hotel Ravensberger Hof in Bielefeld, you'll be within a 5-minute walk of Nicolai Church and Old Market Square. This hotel is 14.6 mi (23.6 km) from Gerry Weber Stadium and 16.6 mi (26.7 km) from Zoo Safaripark Stukenbrock. Make yourself at home in one of the 65 guestrooms featuring tablet computers and flat-screen televisions. Complimentary wireless Internet access is available to keep you connected. Private bathrooms with showers feature complimentary toiletries and hair dryers. Conveniences include phones, as well as desks and minibars. When you stay at Quality Hotel Bielefeld in Bielefeld, you'll be in the suburbs and 15 minutes by car from Bielefeld Japanese Garden. 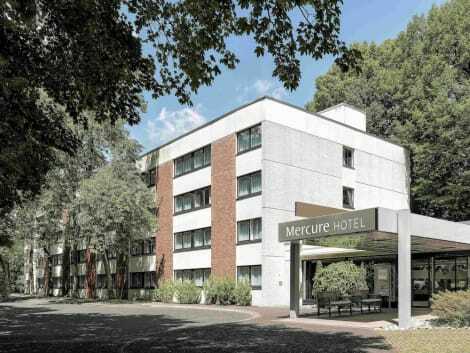 This family-friendly hotel is 7.2 mi (11.6 km) from Zoo Safaripark Stukenbrock and 6.8 mi (11 km) from Bielefeld Hospital Chapel. Make yourself at home in one of the 161 air-conditioned rooms featuring flat-screen televisions. Complimentary wireless Internet access keeps you connected, and satellite programming is available for your entertainment. Private bathrooms with shower/tub combinations feature complimentary toiletries and hair dryers. Conveniences include phones, as well as safes and desks. lastminute.com has a fantastic range of hotels in Bielefeld, with everything from cheap hotels to luxurious five star accommodation available. We like to live up to our last minute name so remember you can book any one of our excellent Bielefeld hotels up until midnight and stay the same night.